I wasn't sure what to expect when I rode up on my 21-speed to the Beastmode store in downtown Oakland, my daughter sitting comfy in the child seat attached to the back of my bike. Even though it was past her nap time, I figured we’d just see what all the commotion was about. At first, I only saw 25-35 other people on bikes gathered on Broadway in front of the store, awaiting the start of Oakland Rideout 2, the second city-wide ride hosted by NFL players Marshawn Lynch and Josh Johnson. But then I pushed past the first cadre of cyclists, peeked around the corner at 10th Street toward Washington Street, and boom: a massive fleet of cyclists and scooter riders. Hundreds of them. All waiting on the start of the ride. 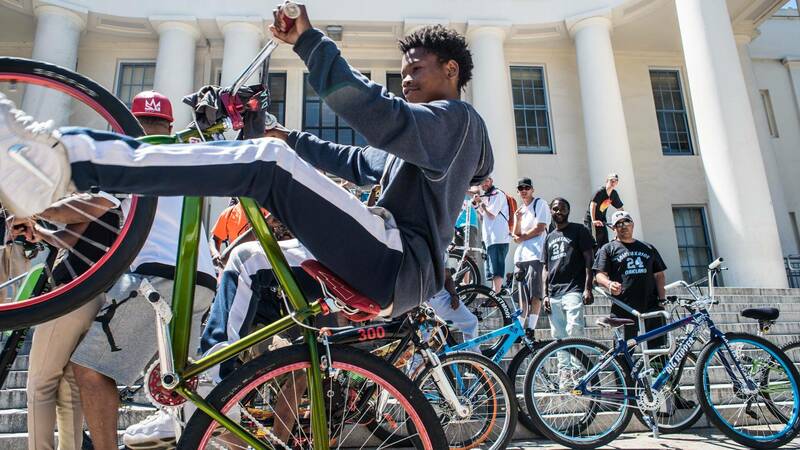 Oakland Rideout is just that: a bike ride. It's not a protest, or a demonstration. But in a year when people of color have had the police called on them for BBQing, selling water, being a firefighter, checking out of an Airbnb, sleeping in their own dorm—the list goes on—simply taking up space and celebrating together is an act of liberation in itself. And yeah, there were big names involved. 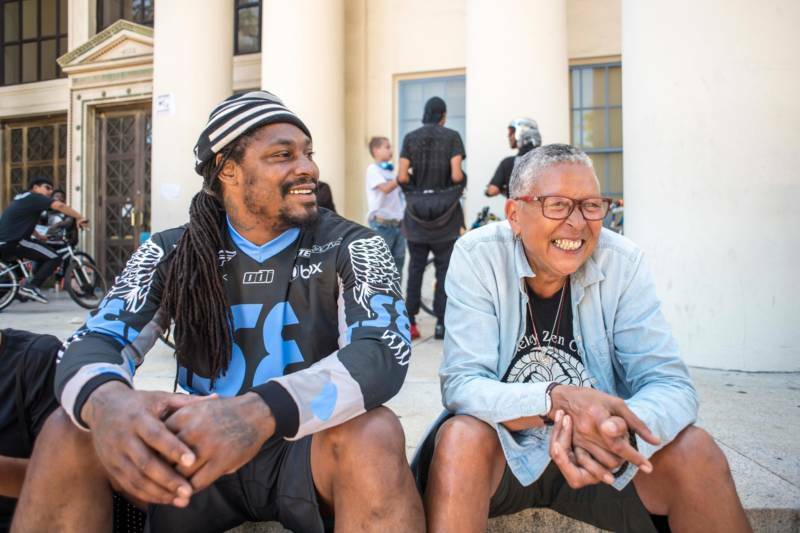 Along with Marshawn Lynch, the ride involved a handful of pro BMX riders, SE Bikes, and even a business sponsor (Lime, which manages those green bikes around town). But really, the ride was about the young people. While waiting for the ride to start, one young brother rode in my direction, standing with one foot on his seat and the other on his handlebars, as he “surfed” his bike past the "For Lease" sign at the base of a newly constructed building full of overpriced apartments. Moments later, NFL star Marshawn Lynch, Beastmode himself, pulled up and hopped out of the passenger seat of what looked to be a late-'90s–early-2000s four-door Honda Civic; “an under bucket” would probably be the best local colloquialism I’d use to describe the vehicle. 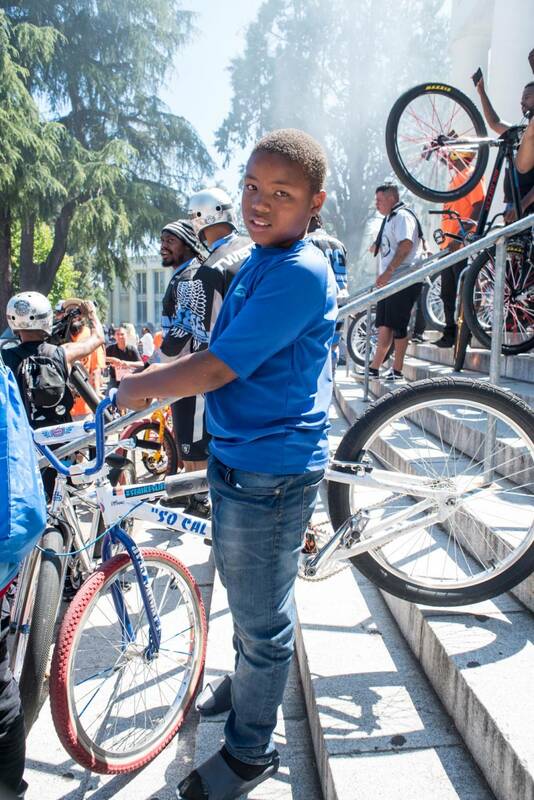 A crowd of teenagers flocked around him as he and his cousin, NFL Quarterback Josh Johnson, prepared to ride out. A couple minutes after noon, the platoon took to the streets; I fell inline. First commandeering Broadway, headed north to 11th street, where we made a right and headed east. We went through the tunnel by the museum and around the southern fringe of Lake Merritt, before banging a right on East 14th Street. The first neighborhood we hit is commonly referred to as Funktown. 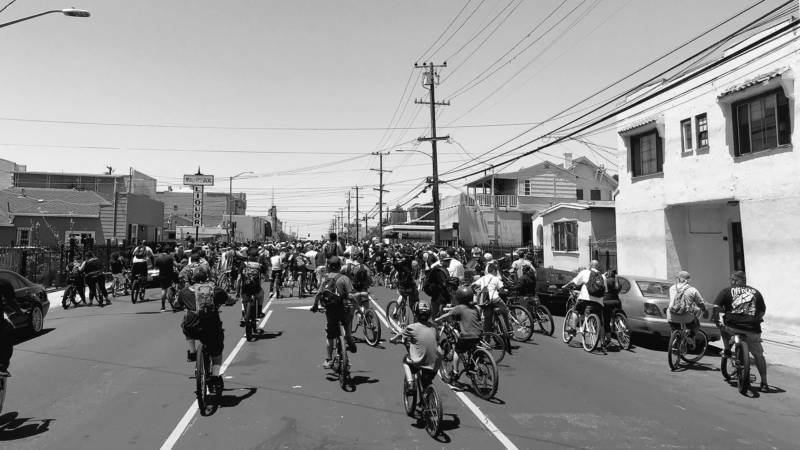 There, Asian storeowners and residents stood curbside, cameras in hand as they recorded the stream of what had easily grown to over 1,000 cyclists. 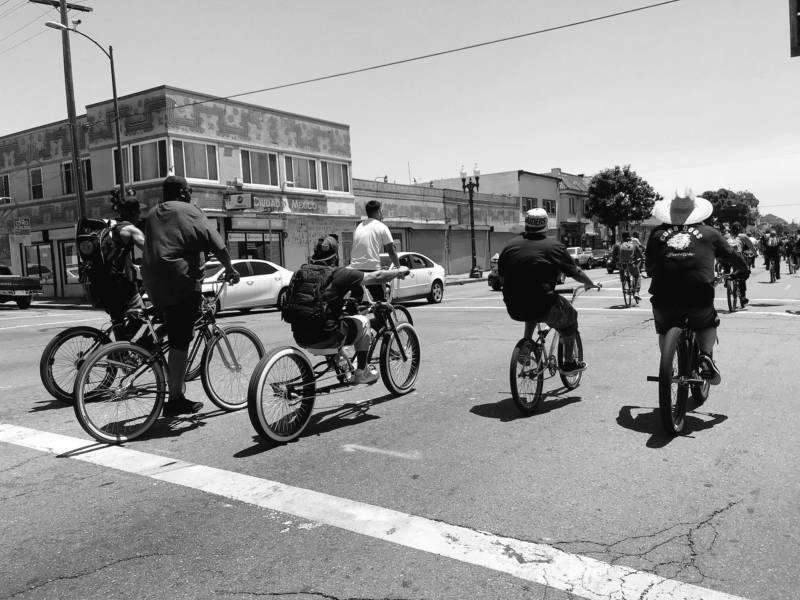 All shades of black, brown and white people were in motion through East Oakland—mostly boys and men, but plenty of women scattered in the pack too. All ages, too: I saw some artists who are OGs in the graffiti world, and cheered on the push of an elementary-aged kid as he rode a bike that looked like its training wheels had just been taken off. All the while, my daughter was comfy in her seat, waving at people; she didn’t appear to be thinking about that nap, and probably wouldn’t have been able to sleep through the music anyway. There were people with Bluetooth speakers, a couple folks with three-wheel bikes allowing them to carry larger speakers, and even one guy who had a studio monitor-sized speaker strapped to his back. 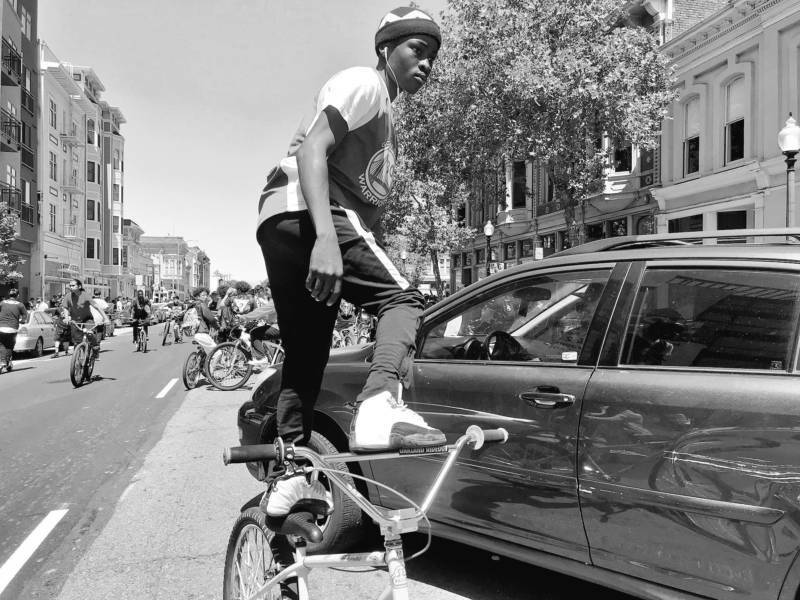 These mobile sound systems blasted well-known hits from local artists, folks like Mac Dre, Kamaiyah and ALLBLACK, and the people on the streets couldn’t help but watch in amazement. The young black sister on the corner with the short skirt and tall heels who smiled as we passed. The older Latino brother in the 10-gallon hat who waved as he stepped outside of the Iglesia. The little Filipino kids on their apartment stairs who pointed in awe as the fleet flew by. This procession might sound chaotic, but it wasn't. The professional BMX riders and others working the event paused at each intersection to make sure traffic didn’t cross our path. They were also vocal toward the cyclists, demanding we all stay to the right, so as to not block oncoming traffic. We dodged potholes and kept pedaling as we came around the corner near Rainbow Recreational Center, where the scene was parade-like. People stood on their porches cheering for us and asking us where we were going. We traveled up Seminary, in the direction of where a man had been killed on the Friday night prior to the ride, but turned a left on Foothill before reaching the crime scene. Some people cut through the parking lot of the newly constructed Seminary Point shopping center, hitting wheelies and doing bunny hops over the curbs. We biked through the smell of weed being smoked and BBQ grills getting lit. We passed the Muslim Brothers in suits in front of the mosque, past Fremont High, then past the Mac Dre mural and the “We Buy Ugly Homes” advertisement. People in cars stuck their arms out the window for high-fives. We eventually ended up at San Antonio Park for our first real rest. It was enough time for my daughter to have a snack, run through the grass and play on the swings. (Nap? What nap?) An impromptu bike sideshow started in the middle of the street, as someone on a dirt bike swang donuts and people gathered around to watch; Marshawn and Josh included. After the smokers got their tokes and the sippers wet their lips, people were back on the road: Lake Merritt bound. As we descended on the Lakeshore side of Lake Merritt, I thought about all that's transpired in that area over the past few weeks: the stories of “BBQ Becky” and “Jogger Joe,” and how those cases were largely about power, privilege and policing the lives of people of color. Even the story from a day prior to the bike ride, across the Bay, where a white woman called the police on a little black girl for selling water—the “Permit Patty” incident. 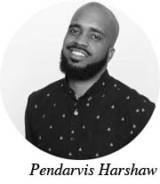 Whether it's the selling of water, sleeping in a makeshift dwelling or preparing food with family, these stories are about people of color simply existing, and people with perceived power policing their existence. But on Sunday afternoon, the bikers weren’t having that. They were existing to the fullest; living their best life, as the kids say. I saw the late June sun bounce off of so many gold grills that day. 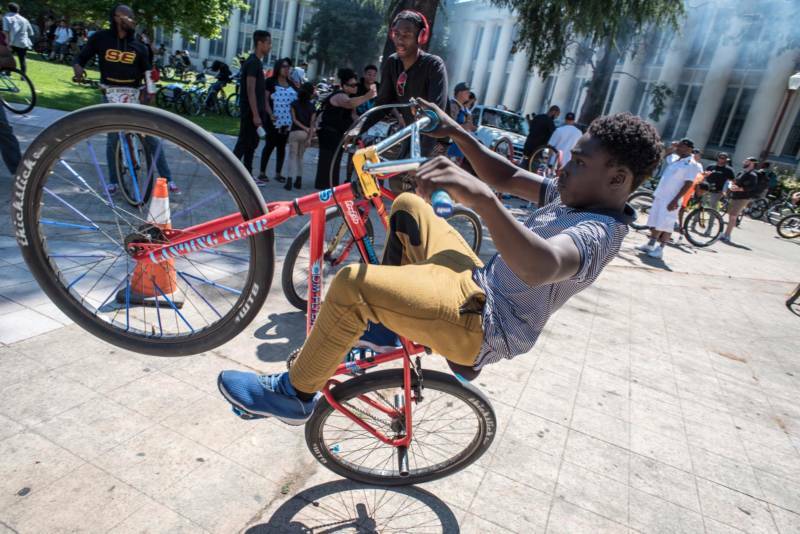 I mean, I also saw a half-dozen minor bike accidents; people falling after trying to stunt on wheelies or ride with no hands. One young man on a double-decker scraper bike without brakes rear-ended someone else. But I didn’t see any injuries, nor any major conflicts between bikers or drivers. Everyone who fell got back up and kept riding. And even that aspect of the ride is important. These kids were free to make mistakes, which all too often isn’t the case for young people of color in America. Mistakes? Hell, for some, simply existing is its own consequence. 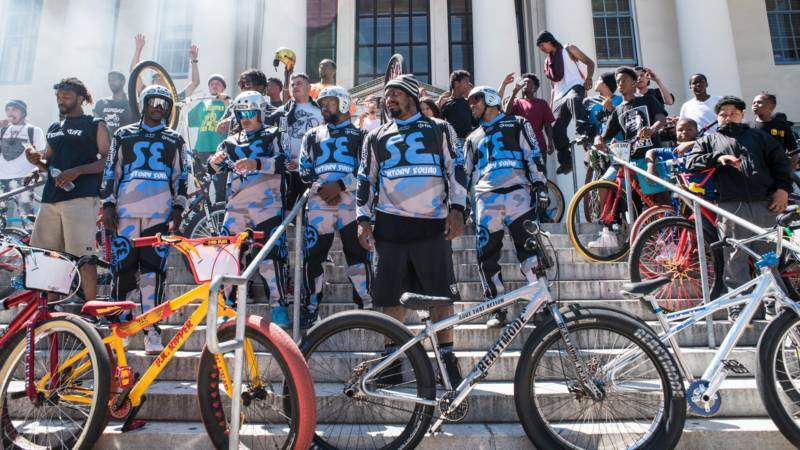 And no, Marshawn and Josh, the sponsors and the BMX riders—they weren’t organizing a protest. They weren’t politicizing the people of Oakland. They were just giving folks a chance to get out, exist in public, and claim their space. That's worth a lot these days. As the seemingly never-ending trail of bikes wrapped around the northern portion of Lake Merritt, flowing from Lakeshore to Grand, eventually back downtown and then toward Marshawn and Josh’s alma mater, Oakland Tech, my daughter and I spun off. It was well past her nap time, and almost time for mine.